Varicose veins take away the beauty and appearance of your legs. Perhaps more importantly, varicose veins produce significant symptoms and can lead to serious medical conditions. The good news is that varicose veins can be removed quickly, with minimal discomfort, in a doctor's office. There is no need for hospitalization and the recovery time is measured in minutes, not weeks. Almost immediately, you will be able to do all the things you did before you developed varicose veins. While this may sound too good to be true, the expert doctors at the VARICOSE VEIN CLINIC using clinically proven new technology called endovenous ablation therapy can eliminate your varicose veins with a minimally invasive procedure in the comfort and security of our clinic. The procedure takes about 45 minutes and the recovery period is about 10 minutes. In about an hour you can be free of your varicose veins. You will be able to return to normal activities the very next day. 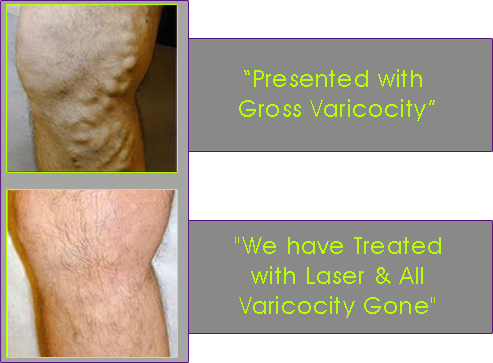 Varicose Vein Clinic is committed to providing you with the most comprehensive, advanced and personal care available. We tailor every treatment to each individual patient's condition and needs. Dr Rajesh Hydrabadi & Dr Mohal Banker are expert doctors in this field who offers endovenous ablation for varicose vein. Varicose vein clinic is located in prime area of Ahmedabad, which is well connected with other areas of Gujarat. Varicose Vein Clinic is center of choice for treating any vascular condition you may have, for your best health yet, and your life. Please call or visit our center today to experience the Varicose Difference.